Do you have a knack for playing friendly pranks on your friends and family? Do you enjoy tangling up other's hair while they take a quick catnap, or maybe hiding your roommates' car keys, or is leading others on a wild goose chase from time to time more your specialty? Well if you get joy out of pulling all these harmless pranks on others then, guess what? You may actually not be as human as you thought you were. In fact, you may be a fairy!... or at least part fairy. According to the folklore, fairies enjoy toying with us humans, although some of them take it a bit far and enjoy, more so, our suffering and the hardships they can cause... not quite the helpful of creatures that you thought them to be in the first place, right? Either way, fairies are still pretty awesome in our book and if you want to truly feel like the mythical woodland creature, that you very well may be, then start looking more like your legendary ancestors. This Women's Floral Fantasy Wig will be a great start to any fairy costume! 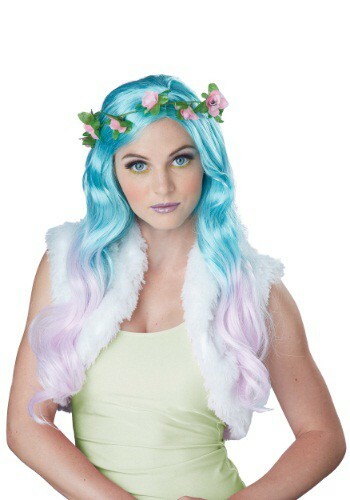 Add a set of butterfly-like wings as well as a pair of floral slippers to match your new hairdo and you're set to go out and be the best fairy you can be.